Why are Tennessee residents buried in coal ash? West Virginia reporter Ken Ward, Jr., an expert on the coal industry, says some good reporting has been done on the Dec. 22 TVA dam break, but a lot more needs to be done—including following the paper trail to find out why the dam broke in the first place. 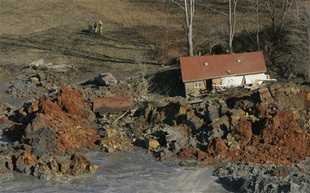 In the wee hours on Dec. 22nd, a dam broke at a Tennessee Valley Authority coal-fired power plant in East Tennessee. While most Americans -- including a lot of journalists -- were finishing up the last of their Christmas shopping, the latest coal industry disaster began unfolding. Millions of gallons of wet coal ash -- the most recent estimate is 5.2 million cubic yards -- poured out to cover 300 or more acres of fields, homes and streams. The response from the media has been interesting, as has been the response to the media coverage, or to an alleged lack of media coverage. Several good sources of mine in the environmental community have confronted me, demanding to know why my paper hasn’t done more. The answer? Well, this happened in Tennessee, and we’re in Charleston, West Virginia. And, from a personal standpoint, I took a few rare days off to spend Christmas with my 4-year-old son. I suspect that if the media coverage has been inadequate, the holiday timing of the disaster -- when newsrooms are even tighter on staff and other resources than otherwise in today’s economy -- played a big part in that. The public owes its thanks to folks like my fellow Society of Environmental Journalists member Anne Paine of the Nashville Tennessean for working through the holidays to get out news of this event. At the same time, some good friends of mine in the journalism business have suggested both privately and publicly that the “mainstream media” has dropped the ball. I’m not sure I agree. I used to be right there with them on the issue of the media’s failure to cover coalfield problems. But then Project Censored ranked mountaintop removal coal mining as among the Top 10 censored stories in 2006. Project Censored cited an EarthFirst! newsletter as among the best and only coverage of an issue that I and many other reporters on a local, regional and national level have given much attention. One friend sent me an email she received that derided the lack of media coverage of the coal-ash mess, complete with a list of links to major media coverage of the incident. At some point, claiming the media ignores you becomes counterproductive, especially when the media clearly isn’t ignoring you. So let’s take a look at what has been done on the Tennessee coal ash disaster, and discuss what angles the media has explored and where reporters might want to take the story next. First, a lot of the criticism I’ve seen has focused on a lack of solid coverage by CNN. Well, that’s what happens when a news organization eliminates its entire environment and science team. What else is there to say about that? Next, the big newspapers have actually done a few interesting stories. At the New York Times, for example, Shaila Dewan had an initial story on Dec. 23, the day after the dam broke, and a follow-up story Dec. 24 that explained the important context of the ongoing debate over the toxic dangers of coal-ash disposal. The Times ran another strong story on Dec. 26, focused on TVA’s admission that the amount of ash that was released was much larger than agency officials initially reported. Juliet Eilperin wrote a similar story for The Washington Post. But the Times kind of jumped the shark, in my view, when it made a big deal in a story this week that TVA had disclosed the amount of toxic waste going to the ash impoundment at the newspaper’s request. Any reporter or citizen who wanted to could have easily looked that figure up on the U.S. Environmental Protection Agency’s Toxics Release Inventory database. Good on the Times for reporting the number, but why did they feel the need to get TVA to disclose information that was already publicly available? Maybe the Times was looking to get a scoop, given how much of the information coming out about the Tennessee situation is coming out of non-traditional media. The really smart journalists are learning Twitter, joining in community discussions online, and otherwise trying to use these new tools not only to gather information, but to bring new readers to their news organizations’ products. But a lot of the “new media” on this, like so many other big stories, is made up in large part of links to and commentary on journalism being generated by old-fashioned newspaper reporters. Part-time bloggers with an ax to grind still can’t take the place of trained, professional reporters who are paid to go interview eyewitnesses, dig through government reports, and quiz corporate executives to hold them accountable. Maybe we’ll get to that point, but we’re not there yet. So where should these professional reporters take this story next? And where will the citizen journalists take it if we in the mainstream media don’t do our jobs? Well, it’s already starting to go there. Journalists and citizen journalists have picked up one key issue: While coal-fired power plant ash is the single largest type of industrial waste produced in the United States, there are no federal standards for how this material is disposed of. Several stories in the last week have made that point. You can find that story online at http://www.greatlakesdirectory.org/zarticles/092702great_lakes_coal_ash.htm, and read Jim Bruggers’ ongoing blog posts on the issue at http://www.courier-journal.com/blogs/bruggers/blog.html. The best overview on this controversy came from Anna Jo Bratton of The Associated Press, with a 2007 article that got lots of play around the country and is still available at http://www.washingtonpost.com/wp-dyn/content/article/2007/08/26/AR2007082600656.html. But the driver so far on coal ash coverage has been the toxic nature of the material -- is it harming groundwater, drinking wells or killing aquatic life? What the Tennessee story changes, or should change, is to bring into focus environmental damage. Clearly, no one can now argue that power plant ash impoundments are not dangerous, that a failure could not cause catastrophic loss of life. So what about the safety of the dams that are holding back billions of gallons of power plant ash all around the nation’s coalfields? Well, so far the federal government has left that up to the states to regulate. That’s the way it was before February 1972, when a coal slurry dam broke in Buffalo Creek, W.Va., flooding the downstream communities and killing 125 people. After Buffalo Creek, Congress passed the 1977 Surface Mining Control and Reclamation Act to, among other things, set strict requirements for the design, construction and inspection of coal-slurry impoundments. But that law doesn’t apply to power plant impoundments, unless there is an active coal mine on the same site. One powerful member of Congress, House Natural Resources Chairman Nick J. Rahall, wants to see that change. Journalists and citizens should watch to see how that unfolds, and whether the congressman from West Virginia’s southern coalfields can get the attention of other lawmakers or the Obama administration and force some reform. Environmentalists are also turning their attention to the dam safety issue. “We’ve been focused on the toxic pollution, but clearly we should have paid more attention to the design and construction safety standards,” said Lisa Evans, a lawyer with Earthjustice who has followed the issue for years. Lastly, reporters and citizens must start digging through the paper trail, to find out what might have caused this disaster. Chloe White at the Knoxville News jumped on this last week, when TVA released a February 2008 inspection report that detailed two previous “blowouts” at the dam, in 2003 and 2006. I asked Jack Spadaro, a longtime mine inspector and dam engineer, to look at the TVA inspection report for me. Spadaro said his initial review suggested TVA did not make adequate repairs to deal with internal erosion, called “piping”, a problem that was partly to blame for Buffalo Creek and for the October 2000 failure of a coal-slurry impoundment in Martin County, Ky. The TVA spokesman I talked to seemed surprised that I actually read the inspection report, rather than just relying on the agency’s “Fact Sheet.” Chloe White reported that TVA has the preliminary findings of a more recent inspection, in October 2008, that found a “wet spot” and a “minor leakage issue.” But to my knowledge, the TVA has not yet released that more recent report. There are a lot of stories yet to be told on this one. Did TVA have ample warnings of problems with the dam, and did the agency do enough to fix those problems? Will regulators do a proper investigation, and will TVA be entirely forthcoming in the weeks and months ahead? It’s up to the journalists to find out. Coal Ash can actually be used fuel for a Plasma Arc Power Plant. It should be mandated by state legislatures to build Portable Plasma Arc Power Plants to use up and eliminate this Coal Ash Waste. Also, Georgia Tech and CERL are the American Pioneers in this Technology – http://www.cecer.army.mil ...POC: Dr. Ed Smith Commercial 217-373-3488 or 800-usa-cerl – Georgia Tech POC: DR. Louie J. Circeo Comm 404-894-2070 or Construction Research Center (CRC), Georgia Institute of Tech, Atlanta, GA 30332-0159. This is proven technology which has been used by Japan since the 1990s with the contrustion of over 20 plants. Coal Ash can actually be used as fuel for a Plasma Arc Power Plant. It should be mandated by state legislatures to build Portable Plasma Arc Power Plants to use up and eliminate this Coal Ash Waste. Also, Georgia Tech and CERL are the American Pioneers in this Technology – http://www.cecer.army.mil ...POC: Dr. Ed Smith Commercial 217-373-3488 or 800-usa-cerl – Georgia Tech POC: DR. Louie J. Circeo Comm 404-894-2070 or Construction Research Center (CRC), Georgia Institute of Tech, Atlanta, GA 30332-0159. This is proven technology which has been used by Japan since the 1990s with the contrustion of over 20 plants.